I have recently seen a number of health care professionals using Gabapentin, which is used to treat epilepsy, postherpetic neuralgia (shingles), but also widely prescribed off-label to treat fibromyalgia, neuropathy, migraines and other chronic pain conditions. In 2016, 64,000,000 prescriptions were written in the U.S. for Gabapentin, the 10th most prescribed medication. This is a 49% increase in just 5 years. In researching this issue, it appears that Gabapentin can increase or heighten the effects of opiates as well as heroin, marijuana and cocaine. With the opioid epidemic underway, people are looking for another way to relieve their pains and help them to relax, sleep and feel good. Most drug tests do not check for Gabapentin unless it is specifically included in the panel. 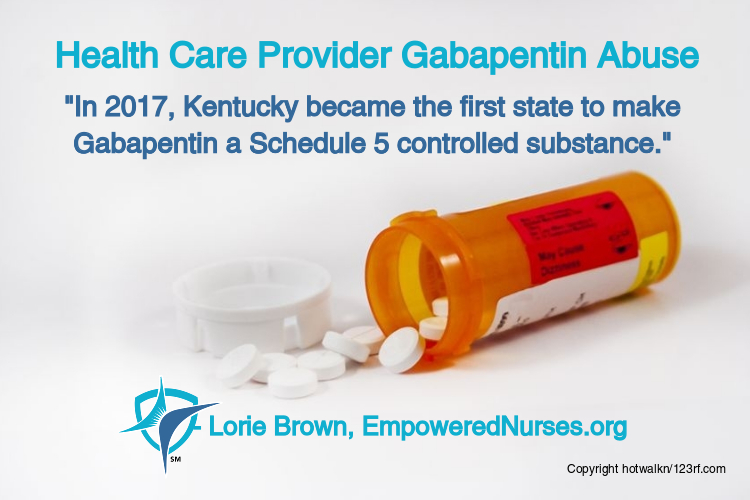 In 2017, Kentucky became the first state to make Gabapentin a Schedule 5 controlled substance. It is something that I assume will occur eventually in other states as well. If you take Gabapentin, just like any controlled substance, I would suggest strongly that if possible, get off it. I believe this substance will be tested more and more even though at present it is not a controlled substance in many states. It will be soon but, for now, the Boards are on alert to look for Gabapentin abuse. This Drug is now being prescribed for anxiety & depression if patients are leery about other prescriptions not knowing the dangerous effects. It is being promoted as a safe & natural substance because It occurs naturally in our bodies. Patients subscribe to this thinking & do not know the dangerous effects it can have. What medication will be left for a patient living with chronic pain? I would take this medication to feel better too if I needed it. Yes, we give it all the time to help make other medication work better. To me, this is a huge over-reaction. Might as well take NSAIDs away too because we all know the problems that can cause. When will insurance companies pay for things like biofeedback, more counseling, more PT/OT, massage therapy, acupuncture, or other healing arts therapies? I stand with the millions of chronic pain patients that have used their medication appropriately, stayed in the work force and provided for their families. They have been criminalized by the war on opioids. Who will give them a voice?? Respectfully, I strongly disagree. Gabapentin is a safe nonaddictive that does not get you high. Im tired of catering to those who abuse drugs. If ut heightens their high while using illegal drugs i dont care. Punishing people who do not abuse drugs is insane. In Vegas doctors are afraid to prescribe pain meds. Even after surgery you are sent home with no pain meds. You can follow up with a pain specialist for pain meds. It can take a few weeks to get appointments. It also costs more money to go to a specialist. My husband was in a serious motorcycle accident. He will have chronic pain for the rest of his life. He does not abuse drugs or drink. In fact he only takes tramadol. Which is addicting but its does not have the opiate and patients dont stop breathing. He also doesnt have the urge to take the whole bottle or even need an increase. You have to go evey month and also submit a drug test. If they dont have an appointment then you go without pain meds. Suddenly stopping a pain medicatin can cause seizures. They dont seem to care if they cant get you in before you are out of medication. Why should we suffer for addicts using cocaine and heroin. Im not trying to be mean. If they use and die thats on them. If they want to stop i will be more than happy to not judge and assist. But please dont put there issues before the rest of the people who really need medications. Thanks for listening. I work in Palliative Care. Our patients have severe chronic pain from life changing health issues that have not responded to treatment or interventions. Most are on opioids as well as other alternative medications or treatment for pain. We monitor for compliance. Daily I have patients in tears because they are scared they will lose their ability to utilize opioids for severe pain. They are tired of other health care providers and pharmacists treating them rudely. They are tired of their insurance company denying a medical regimen they have been on for years. We do the very best we can to safely educate our patients and watch for evidence of misuse. I wish there were other safer medications that would reduce chronic pain, I know there are studies in the works. However, for now let us recognize that many individuals can safely take opioids when working with caring trained providers. I’m a Registered nurse and this is 100% ridiculous and insane to make this drug look so bad! I know the drug has been very helpful to many people including my mother. I am an LPN who is also a rbka. I took this med for my phantom pain. Now looking for another med that will work. When will it stop with people abusing meds? I hope you get the help to relieve your pain.